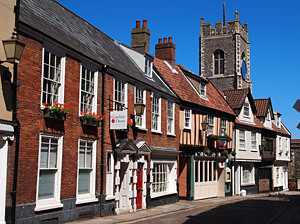 East Anglia's flourishing capital, once an important capital for the medieval weaving industry, is still today one of the most prosperous centres outside London. Norwich's old medieval market place still hosts a large bustling market every weekday. Many quaint old cobbled lanes and alleyways, crowded with antique and curio shops lead from the market, and there are several pleasant areas of the city to explore, particularly in the picturesque area of Elm Hill. As you walk through the city you will find many interesting buildings, many of which show Dutch influence in the form of ornamental gables. 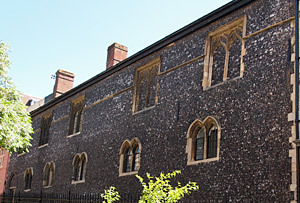 The lovely 15th-c chequered-flint Guildhall, presides next to the market square and on St Andrew's Street is the Strangers' Hall Museum, one of the oldest buildings in Norwich. Nearby, in a little alley off Bedford Street, stands the Bridewell Museum, full of local crafts and industrial heritage. The square keep of Norwich's magnificent pristine Norman castle, rises high above the city on a landscaped hilltop. 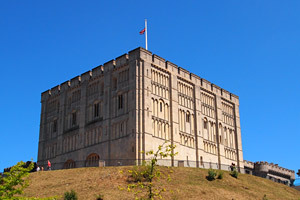 The castle's keep houses the City Museum and Art Gallery, and includes a large collection of local art and paintings by members of the Norwich School of Painters. 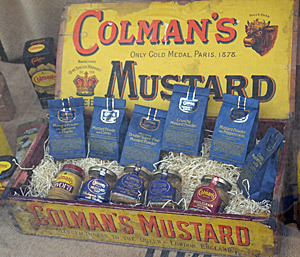 Located in the historic Art Nouveau 'Royal Arcade' is a Victorian style mustard shop, which includes a small museum run by Colmans, who have been producing mustard in Norwich for over 180 years. Mustard products and related memorabilia are for sale. Unquestionably the finest building in Norwich is its spectacular cathedral, whose slender tall spire rises high above the water meadows of the River Wensum. 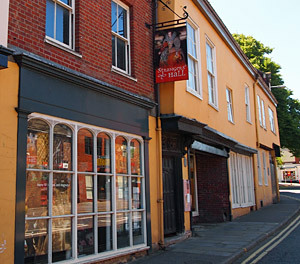 The walled 'Cathedral Close' is lined with elegant 18th-c houses, that stretch down to the river where the picturesque 16th-c Pull's Ferry house and the Old Inn stand; much photographed and portrayed in local paintings. 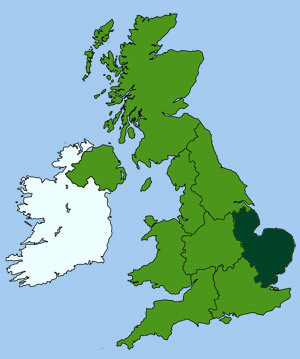 In addition to the great Norman cathedral, Norwich has a Roman Catholic cathedral and no less than 32 medieval churches. Parts of the old medieval town walls are also still visible on the outskirts of the town. The city is not just full of historic sights, it has a vibrant nightlife, sophisticated shopping facilities and many top class restaurants. With its preserved historic buildings and wide range of high street stores, designer brands and specialist shops, Norwich was recently been voted one of the top 10 places to shop in the UK. Located in an original 1942 Radar Operations building. Contains a series of historical operations rooms, including a 1940s Battle of Britain Room, 1942 Blitz Operations Room and Cold War Operations Room. The museum also has exhibits on air intelligence photography, radar development, space defence, air defence missiles and Mobile Radar Vehicles. Interactive guided tours are available. A flint faced, 14th-c merchant's house, once used as a prison (1583 - 1828). The house now accommodates a fascinating museum that tells the story of Norwich's industrial heritage over the last 200 years. Exhibits include local shoe and boot manufacture, a reconstructed 1930s pharmacy, blacksmith and pawnbrokers shop. Also included is an exhibition covering the history of Norwich City FC. Built in the 12th-c, the Castle keep contains a museum with displays of natural history, archaeology, Lowestoft porcelain, ceramic teapots and Norwich silver. The art gallery contains a fine collection of pictures by John Sell Cotman and John Crome, members of the 'Norwich School of Painters' who flourished in the last century. Guided tours are provided of the dungeons and battlements. 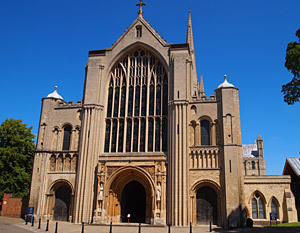 Norwich Cathedral has been a place of pilgrimage for over a 1000 years. The cathedral has one of the highest spires, and the largest monastic cloister, in Britain. The cathedral dates from Norman times and contains the oldest bishop's throne still in used. The nave has one of the finest interiors in the country. The 800 carved medieval roof bosses, painted with Biblical scenes and grotesque creatures, are in themselves a sight worth seeing. Work on the cathedral began in 1069 and continued for half a century. Two medieval gates (Ethelbert - 1272 and Erpingham - 1420) lead into the cathedral precincts. Inside which stands the old Norwich School, founded in 1316, where Horatio Nelson was once a pupil. Tell the story of the social and military history of the Norfolk regiment from 1685 onwards, using audiovisual displays and graphics. A historically preserved medieval merchant's house. Many of the rooms are furnished in the style of different period, depicting domestic life, from Tudor to Victorian.